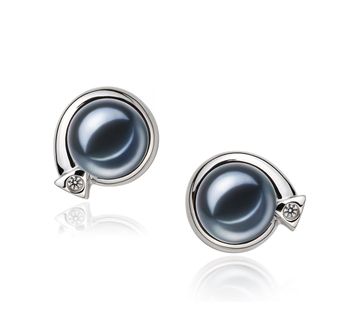 .925 Sterling Silver Arrow wrapped Foundations and Posts with Butterfly backs serve as the gleaming base of the freshwater Black Pearl. 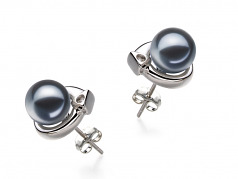 At 7-8mm, this pearl is a comfortable size to fit all ages for the lucky ladies. The AAAA perfect shape is beautiful and engaging with the Sterling Silver Arrow and makes for a fantastic conversation and impressionable piece. The most amazing accent comes in with the mirror like AAAA luster. Its sparkling nature lights up the surface of the pearl and leaves a polish that is hard not to notice by the friends in your circle as well as those beyond your scope. Combining the features of the pure grace and elegance of the Angelina makes for an earring set that is to be transformed into your daily routine with little difficult. From casual to formal, your go to assets are right here for the one with that personality. The Black Label Collection is for the Formal times but these need to be shared with the World.